We are located at 608 Dempster St in Evanston, IL. 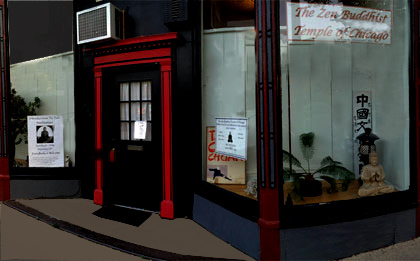 The Zen Buddhist Temple of Chicago is a Soto Zen Temple dedicated to helping practitioners realize their true nature through Zazen, seated meditation. Zen Buddhists hold that all living beings are pure Buddha nature that seems to be obscured by the workings of the discursive mind, fueled by the pressures of modern life. Through daily practice of seated meditation, we allow the discursive mind to settle, and let this true nature be expressed in our daily life. Buddhism is non-theistic. The historical Buddha is not worshipped as a deity, but rather serves as an example of the realization that is expressed through our Zazen practice. Practitioners of other faiths may cultivate themselves through Zazen, supplementing their existing spiritual practice.